The end of the fall season is the perfect time for coaches and players in the volleyball program to reflect on their noteworthy performance this year. Volleyball is a great source of pride and joy here at TJ. The volleyball program is extensive and includes four different teams this year with players ranging from freshmen to seniors. The varsity team closed out this season with a win-loss ratio of 10-9 and qualified regionals. Throughout the 2018 season, TJ Spartans have battled it out with some of the best teams in the state. Although they had a bit of a rough start, through perseverance and lots of practice, the girls were able to end off their year exceptionally well. The teams played rigorously against South High School, winning all of their matches. Against the East Angles, varsity fought valiantly in a heated game, but sadly lost the final match. In the last home game of the season against Fruita Mountain, the two opposite teams were tied until TJ unfortunately lost the match in the last set with a score of 9-15. During Senior Night, the team acknowledged and praised senior varsity players Gracey Jarecke and Precious Lopez for all that they have contributed to the program over the years. The girls’ younger siblings, who are also quite talented players, gave speeches filled with love and appreciation for their sisters while their families stood beside them on the court to show their support. Head coach Erik Rhee and JV coach Denny Bryan also spoke about how wonderful both athletes are, inside and outside of practice. “Senior night was so much fun this year,” said Jarecke, “it was so sweet to have everybody’s recognition and to see their support.” It was a special, heartfelt moment for two girls who have truly given their absolute all to the sport here at TJ. TJ’s volleyball teams have spent the long season practicing every weekday after school from 5:30 to 7:30 p.m.. Many of the girls have mentioned that balancing practice and academic responsibilities requires a lot of discipline as they can not afford to slack off. “We have very high academic standards, and the girls embrace that challenge,” explained Rhee. He also mentioned that players should be “prepared to be a student first, then an athlete, to work hard, and be willing and able to put the team above themselves.” It is a lot of pressure to handle in high school, but the athletes say it is well worth it. Plus, coaches Rhee and Bryan are always encouraging and a great source of assistance. “Coach Denny is probably the best coach I’ve ever had. As far as volleyball goes, she’s great at teaching us technical stuff and she’s definitely very supportive,” explained junior varsity setter Filiz Baltaci. The coaches spend every moment helping the girls improve their skills and strengthen their unity as a team. “We have each other’s backs, on and off the court,” said Jarecke. Many of the players agree that one of the best aspects of playing is the sense of community and friendship that they form. As a team, the athletes learn and grow together as they overcome challenges and improve their own skills. However, another part of what makes the team so remarkable is the continued support the coaches provide. Baltaci says, “a big thing that [both our coaches] point out is that if we want to get better, we can’t just wish for it, we have to do something about it and apply ourselves.” This sentiment is shared by the whole team, demonstrating that the sport is not only fun, but also teaches valuable morals that can be applied to other aspects of life. There will be changes coming to the volleyball program in the coming years. With players Jarecke and Lopez graduating, two spots on varsity will open up. This provides an opportunity for new students to prove their skills and advance to playing at a higher level. Athletes who have shown growth and increased effort are likely to be considered to fill the two open spots. 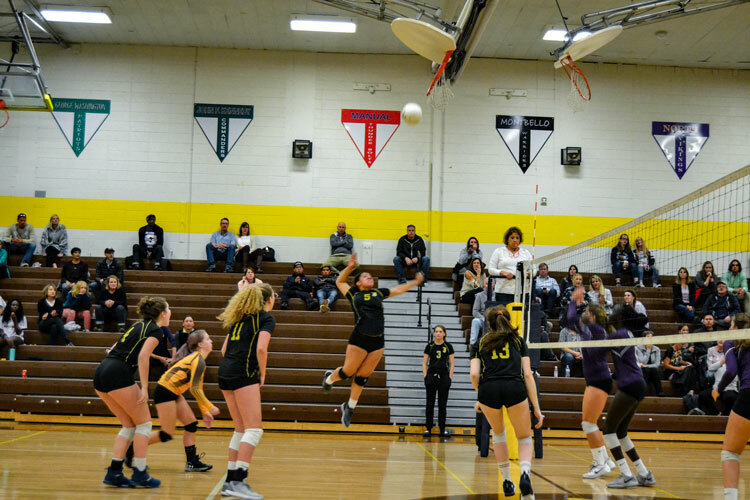 The coaches recognize that the TJ volleyball program is quite competitive and qualifying for JV or varsity can be quite challenging, but they encourage all students who are interested in playing to try out. All of the volleyball players worked hard and made the Spartan community proud this year. Certainly, they will continue to impress and do their best next season as well.